Valentine’s Day 2011 was the start of a new website, Zeitgeist got the honours. It is the first of EXARC’s websites which is made as a Content Management System, meaning all members in this partnership can change and add content – exactly how a partnership should work. It is funded from the money the partners had received from Grundtvig for this partnership. With this, Zeitgeist has some tools for their project: handbooks, a forum, a glossary of terms and much more. A few weeks earlier, when the first screenshots of the Zeitgeist website were shown to the group, people responded very positive! 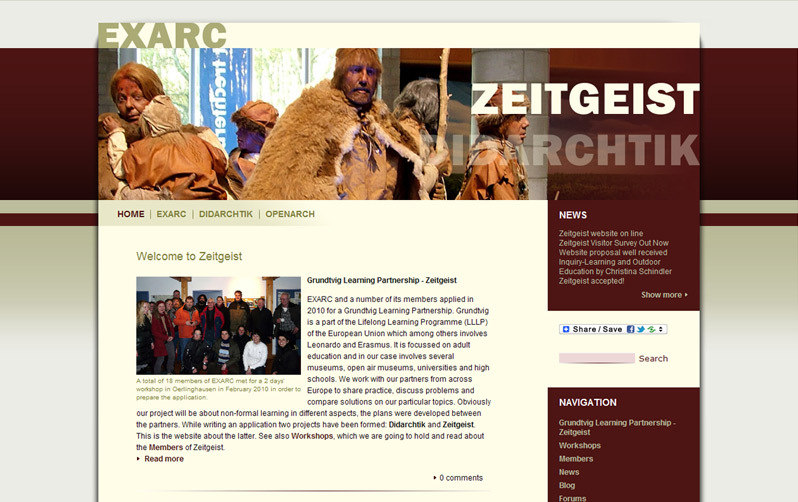 As Zeitgeist is about adult learning and mobilities, it is not just about any kind. We have 'won' this project with specific extra reasons: the themes we discuss and work with at our meetings and the products we end up with having. To make it cost effective as well as longer lasting, most results will end up as part of this website. It seems all to go very well!